Do You Know How Low Vision Can Affect Safety for Seniors? Most of us have a tendency to take our senses for granted. That is, until we begin losing them. As people get older they run the risk of numerous challenges, including hearing loss and vision related problems. When a person begins struggling with their ability to see as well as they used to, as well as they have become accustomed to throughout most of their adult life, safety issues can arise. March is Save Your Vision Month and the older a person is, the more likely he or she will have dealt with at least some major vision related problems, whether it was cataracts, glaucoma, macular degeneration, or something else. When those things begin to occur, their ability to see well enough to stay safe becomes compromised. A number of safety issues should be addressed, especially when a senior is having difficulty with their vision. They may not see things in their way. If a person is dealing with macular degeneration, for example, they will begin to lose their ability to see clearly right in front of them. They may maintain their peripheral vision, but how difficult will it be for them to walk around the house and avoid tripping over something that is right in front of them? If a person is dealing with glaucoma, it can affect their peripheral vision. While that might not seem important for safety, as a person moves throughout the house, they don’t often turn their head to look in front of them before they take a step in another direction. This becomes habitual, so they may need to develop a new habit to keep themselves safer. The senior might have trouble reading instructions. 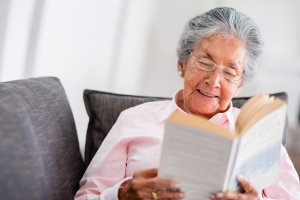 The most common vision related problems people face as they get older is having greater difficulty reading. If the senior does not read instructions as well as they used to, they may get in the habit of skipping them altogether. When you’re talking about prescription medications, cooking foods, or even using certain cleaning solutions, there is a potential for serious safety hazards arising quickly. Even if they’ve lived in this home for most of their life, they might be walking and not see the steps that are right in front of them. It could be a split-level ranch where there are two steps leading to another portion of the house. If they miss a step they can trip and fall and that can lead to serious injuries. It’s important for seniors to visit an eye care professional every year and especially if they begin having difficulty seeing as well as they used to. This entry was posted in Home Care Oakland TN, Safety at Home and tagged Home Care Oakland TN. Bookmark the permalink.